GarryB wrote: The idea behind the integrated air defence network is to share data and have a layered missile defence arrangement that also includes interceptor aircraft too. was that all of the demasked their positions risking USAF retaliation. ASURK-1M command post emerged. Army PVO got Krab command post. integrate, command, distribute targets between SAMs and PVO aviation,analyze data from different and numerous radar system,manage ECM/ECCM systems,manage ELINT system, decoys etc providing target distribution, ECM/ECCM PVO fighter protection and enemy ECM suppression,provide firing solutions,manage ELINT and communication between subordinate and higher echelon command post of same and different command post classes in every situation. 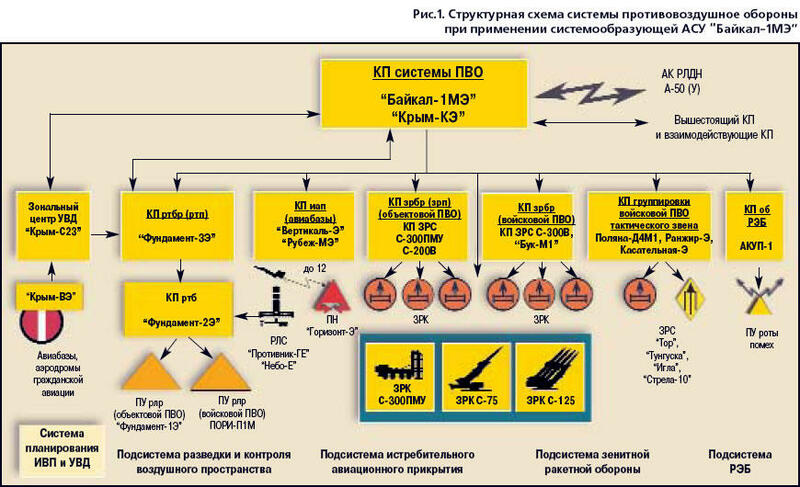 Automated control system "Baikal-1 ME"
Integration of first SAMs like S-75, S-125 and S-200 in IADS with higher level command posts were quite soon possible as those systems were stationary and their coordinates were fixed for longer time and positions were connected by cables. They could put another working console with a scope in battery command post or in additional van to coordinate work with higher level command and to give radar picture to them and to receive radar picture from other sources and target delivery from higher command. Maybe at beginning they got only target delivery, but even these improve capabilities of old SAMs. I don't know, if such export old SAMs have such capabilities to integrate in higher level of command chain. Iran made their own modifications in their S-200 complexes with additional working consoles to integrate their S-200 batteries in their IADS. So we've read lists about IADS, but how complete were they? When we speak of IADS, is it just ground based systems, but what about aerial systems like Mig-31BM's, or AWACS like Beriev A-50/A-100, or any known drones apart of IADS? What about naval based systems that can potentially extend IADS of Russia beyond it's borders for an additional few hundred Km's? What about future systems for IADS, 57 mm gun systems, electro-magnetic guns that could operate with S-500 units to shoot down ICBM warheads? What about lasers, I know carbon-dioxide lasers lack range and all weather capability to destroy targets, but the Pentagon has admitted that Russia, China, and Iran (using Russian made carbon-dioxide lasers) have actually blinded U.S. spy satellites...is blinding spy satellites by using lasers apart of IADS strategy? Speaking about lasers, what is the viability of gamma ray lasers, whats their current status of development? So in short I'm asking a lot! I know, I apologize, but when we're talking about IADS, what should we honestly include? What should we consider a "comprehensive" or complete lists of systems that cover the whole spectrum of the battlefield? Each force has its own IADs... the Airforce has its mostly wheeled SAMs like S-300P and S-400 and soon S-350, plus Pantsir, while the Army has mostly tracked vehicles like BUK, S-300V4, TOR, Tunguska, Strela-10M, and of course the Navy has its own systems too that are mostly Naval versions of army and air force SAMS. the VKKO is new and has mostly radars including on the ground, in the air, and in space, but also controls aircraft attached to the Air Force. The key will be fully standardising these defences, unifying the SAM types across the board (for instance the new short range IIR homing missile 9M100 Morfei will be used by the air force as a short range self defence and anti missile missile and perhaps also as a ground based defensive SAM, while the Army will use it as a short range defensive SAM and the Navy of course will use it as part of its CIWS. Verba will likely be used as a manpads in the army and navy and likely as a small light AAM for light aircraft in quad launchers. S-350 and S-400 and S-500 will likely be used by the Navy, Air Force, and aerospace defence forces (VKKO). I suspect the numbers and types of missiles will decrease over time as some improve to replace others, but the critical thing will be the integration of the IADs so they can operate together. The VKKOs job is to protect the airspace of Russia... that means from ground up and into space... all the new over the horizon radars they are building they are rapidly filling the gaps. magnumcromagnon wrote: So we've read lists about IADS, but how complete were they? When we speak of IADS, is it just ground based systems, but what about aerial systems like Mig-31BM's, or AWACS like Beriev A-50/A-100, or any known drones apart of IADS? What about naval based systems that can potentially extend IADS of Russia beyond it's borders for an additional few hundred Km's? What about future systems for IADS, 57 mm gun systems, electro-magnetic guns that could operate with S-500 units to shoot down ICBM warheads? What about lasers, I know carbon-dioxide lasers lack range and all weather capability to destroy targets, but the Pentagon has admitted that Russia, China, and Iran (using Russian made carbon-dioxide lasers) have actually blinded U.S. spy satellites...is blinding spy satellites by using lasers apart of IADS strategy? Speaking about lasers, what is the viability of gamma ray lasers, whats their current status of development? IADS is integrated air defense system and it is not only ground based SAMs. Ground based air defense is just one of components. All SAMs have their battery command posts, which are connected to battalion and brigade command post, which is the first higher level, to command, control and deliver targets to air defense cluster of short, medium and long range SAMs. Between all those levels is also exchange of radar picture and command posts could deliver situational picture from outside sources and from higher levels and as well give their picture to higher level. Brigade command post is not the highest, but is connected with higher level command posts like division or army level. Those levels command and control all components in their structure, ground base air defense, air force, VKO, ground forces, etc. Those levels combine picture from all sources like satellites, EW radars, AWACS planes, SAM radars, visual observation posts, ELINT units, etc and coordinate of work of all elements, what means deliver targets to fighter planes, SAMs, ECM units and as well coordinate work of ground forces and CAS planes. Network of command posts connected with optical cables and secure data links integrate all components in one structure. MANPADs are also fully integrated in IADS with Barnaul-T command post and could get situation picture and delivered targets on their screens before they could actually see that target. Same goes for fighters. They could get situation picture and targets delivered through AWACS planes or through ground base AF command structure. Combining the situation picture from all sources, like OTH radars, VHF radars, EW radars, VOPs, ELINT units, AWACS planes and coordinating the work of subordinated units, means, that SAMs and fighter planes like MiG-31 or flankers, get situation pictures and targets to engage without need to turn on their own radars and could engage them in passive regime or turn on only for missile engagement. New automate control system(ASU) that integrates Pantsir, S-300 & S-400 SAM systems & is claimed to feature AI elements is to be supplied later this year. It's been tested with one of the 14th Army Air-force(VVS) & Air-defence(PVO) SAM regiments (TsVO).